Clinicept® Care 8 in 1 continence wipes have been carefully developed by the UK R&D team at Clinicept®, and are the latest addition to their Clinicept® Care patient care & hygiene range. The 8 in 1 continence care wipes are very convenient and easy to use and replace the need to apply long-established continence care methods, which include the use of bowls of water, dry wipes, foams and barrier type cream applications. Each continence care wipe is impregnated with a very advanced continence care formulation which offers an effective 8 in 1 action. The 8 in 1 action formula offers Cleansing, Moisturising, Antibacterial, Hypoallergenic, Barrier protection, Deodorising, Soothing and Restoring. 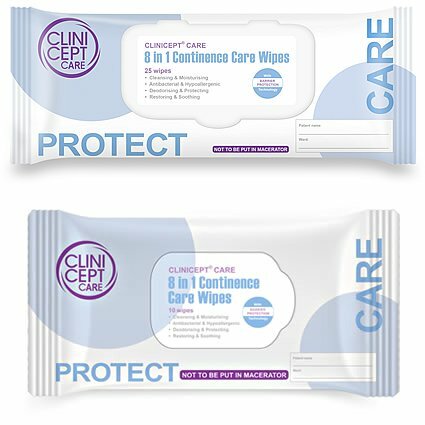 The highly effective formulation contains Dimethicone which forms a protective layer on the skin, sealing out moisture and protecting the skin from urine and faeces.These Clinicept 8 in 1 continence care wipes, use a large, premium wipe cloth. Clinicept® Care 8 in 1 continence care wipes are super strong & soft, pH balanced, Alcohol free, Lanolin free, Dermatologically tested and contain a special soothing triple complex of natural extracts which include Aloe Vera, Camomile and Witch hazel extract. Clinicept® Care continence wipes are available in single patient packs to help reduce the risk of spread of infection. The product is available in packs of 25 large wipes (with plastic lid) and a new convenient size pack of 10 large wipes (with re-sealable label). The product utilises a high quality thick, soft and strong textured spunlace nonwoven material, which has been specifically selected for continence care. We would like to hear about potential UK & International trade opportunities for Clinicept® Care 8 in 1 continence wipes. If you are interested in distributing this product, please click here to contact us by email.